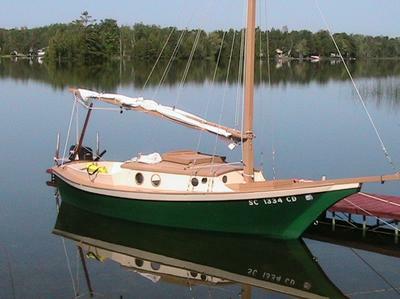 Menehune is a 19.5 Stephenson Weekender Built in Manning South Carolina in 2010. 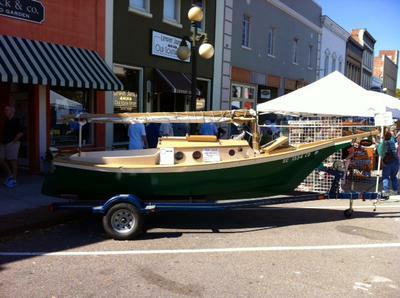 She was built by Kevin Cobb of Blue Heron Boat Works. A Gaff Rigged Sloop she drafts 18 inches. 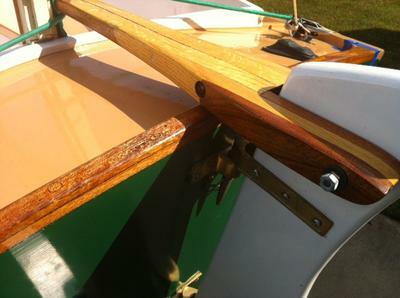 Constructed of Cyprus and Mahogony, a full keelson and transom hung rudder makes her look like something straight out of the 18th century. 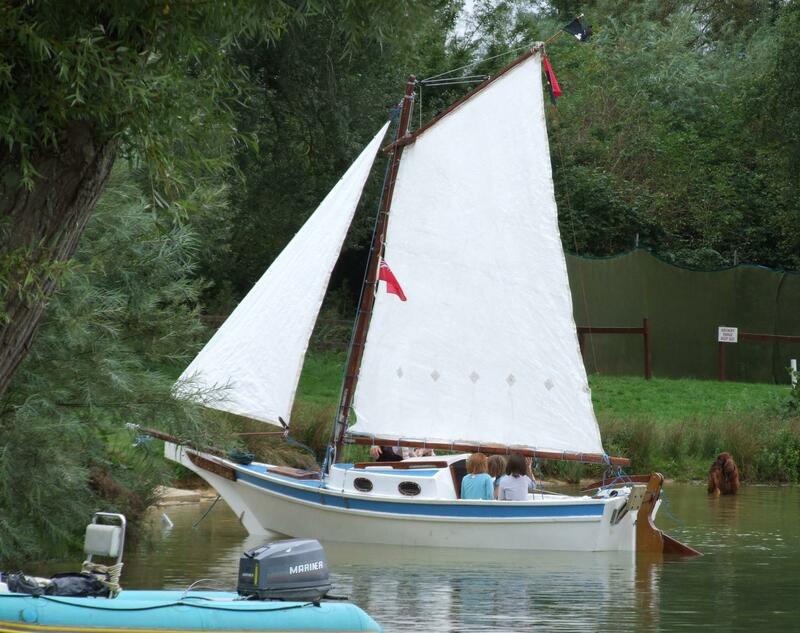 A great little boat and a blast to sail. Menehune just got a 1956 Johnson 3hp jw-12. I picked it up at an antique shop in Gadsden Alabama. The engine runs great and looks fanastic. I took it home replaced the plugs added gas and oil and presto she cranked right up. I let her run for about an hour on the motor stand. I hope I get to put her in the water soon. I will post some pics soon. My solution to this for Sweet Mist was to fit a section of stainless steel Channel section along the keel, bedded down on good quality roofing silicon and secured with stainless screws. One of the great advantages of the weekender is it's ability to be run straight up a sandy beach for that impromptu picnic or if one gets caught out by the weather etc. Great boats for exploring the swatch ways on a falling tide too, just sleep over until there is a foot of water to get you started again! A couple of inflatable bags can be useful too, to put under the hull to give you a level floor and to keep the hull from stone and rock damage. Since my last post she has new sails a new Merc 4hp, Radio and depth finder. We took her to the Gulf of Mexico this past summer at Orange Beach Alabama and introduced her to salt water. She sailed great and with the shallow draft we were able to access some fine drinking establishments along Perdido bay and the ICW. Love your build, these are great boats and fine safe sailers too! I own one in the UK, Sweet Mist, you can see her on the UKHBBR website. I have read so many bad reviews of these boats on the net, but suspect that the reviewers have never even seen one, let alone actually sailed one. 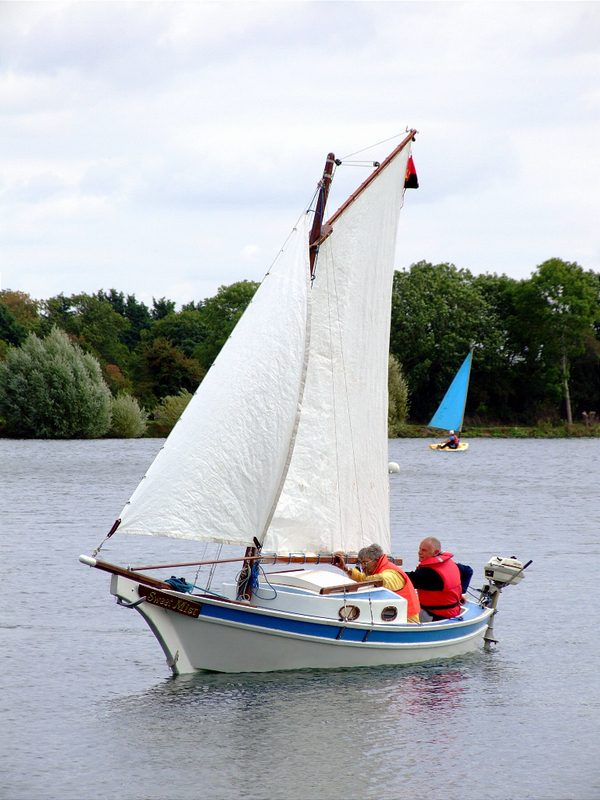 My own experience as an owner is that the boat is well designed, easy and safe to handle and has the characteristics of a very good small cruiser. I would not hesitate to take mine across the English Chanel in the usual good sailing conditions, and sailed with the care and preperation that any boat cruise needs. I'm so glad I saved those photos from the club before I messed up. And looking forward to seeing some more pics of her on the water. Menehune was originally rigged as a Cat Boat. 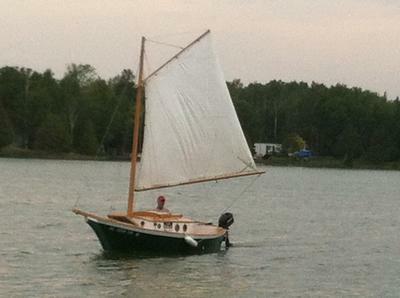 I have added a Jib and deck hardware so she is now a sloop and new graphics on her stern. I cut a jib from an old sail I had in the "barn". 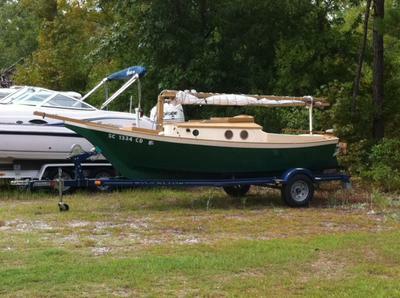 I hope to get her in the water soon to see how she handles. Hey everyone...does anyone have any tips on sail shape on a gaff rig? I took Menehune out this past weekend in about 10-15 knots she handled well but I could not get the long crease out of the mainsail. I tried tightening the halyard loosing the halyard ect but I could not remove the long crease from the front of the gaff to the end of the boom. If anyone has experience in this sort of thing let me know. Meneune now has a new Hummingbird depth finder, a VHF and a new compass. 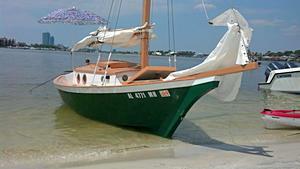 The Wife and I just took "Menehune" to the Gulf of Mexico. The Little Stevenson handled the Gulf just fine. Menehune now has a new Merc 4hp long shaft outboard. My first mate and I have logged several weekends in her and she is sailing well. We got caught in a nice blow (20knots) over the 4th of July weekend and I think we have a new respect for her sailing qualities. These little Stephenson are much harder to knock down than the critics would leave you to believe. I watched the gaff end and made sure it went all the way up a balance between the throat and end solved the problem. 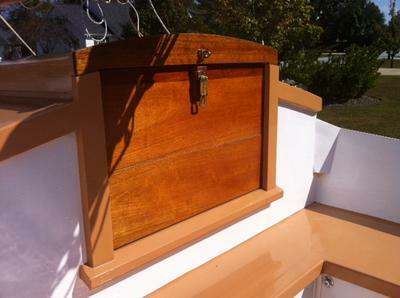 I have noticed that the Keel on my boat Menehune has a few dings in it, mostly from the trailer or rocky bottom contact. Does anyone know of a good way to protect the keel on a boat that will be used a lot over the summer in fresh and salt water. I thought about a keep keeper that glues on bass boats and such but I had rather just paint or apply a coating if there is one available. I will set the up the rig and try out your suggestions. I will post a report later. You've either got too much tension along the direction of the crease or not enough tension along the other diagonal. Sounds like the peak (outer end of the gaff) needs topping up a bit. Try altering the gaff span (where the halyard is attached to the gaff) so as to raise the peak but ease off on the throat.